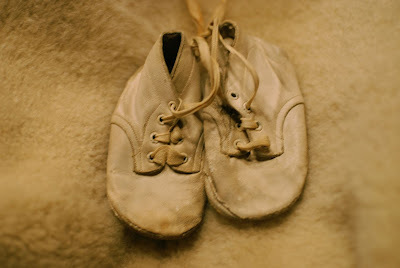 This pair of vintage baby shoes seems the perfect subject for today's Winter Whites submission. I found them for Judy at Red Velvet who is looking for old and worn baby shoes for a project. And of course, baby shoes are high on my list of wonderful white things this winter! How beautiful...there are many lovely winter whites...and you found a very special one. I started participating in the winter white fun today...I was inspired by eb and I also mentioned you in my post. This is so much fun. I know you can't wait to hold that sweet bundle! Soon! These are beautiful. You could spend hours wondering what the wearer got up to! !